The global personalized LASIK surgery market features a highly consolidated vendor landscape along with intense competition among a few established players. The top five participants, namely Abbott Medical Optics, NIDEK, Alcon, Carl Zeiss, and Bausch & Lomb held 87% of the market in 2015. The focus of these players on technological advances and efforts for geographical expansion are the key factors behind their large market share. Going forward, competition in this market is likely to escalate due to continued price war between few key participants. In this scenario, key players are likely to enter into contracts with end users for sustained business growth. These players are also likely to resort to the inorganic growth route thus vie for mergers and acquisitions and strategic alliances with small vendors. 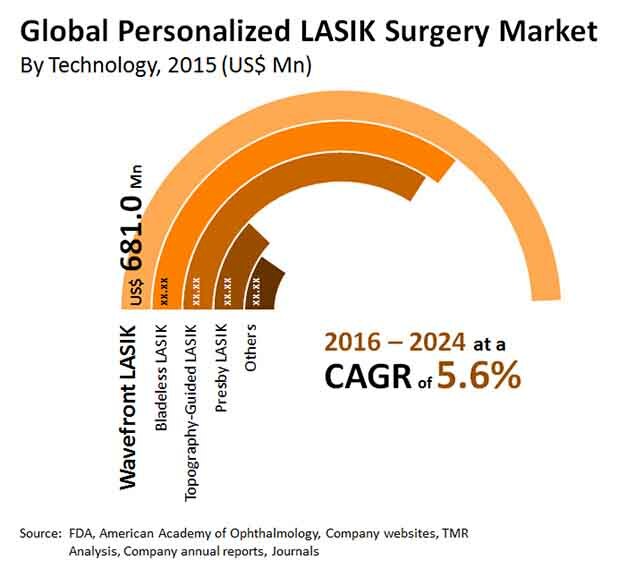 As per a market study by Transparency Market Research (TMR), the global personalized LASIK surgery market is likely to rise at a steady 5.6% CAGR between 2016 and 2024 to attain a value of US$2.6 bn by the end of 2024. The demand in the market was worth US$1.6 bn in 2015. Among the key end-use segments, hospital accounted for the leading contribution to the personalized LASIK surgery market in 2015; the segment is likely to remain at the fore through the forecast period. In terms of geography, North America led the global personalized LASIK surgery market in 2015 holding 45% market share. High awareness about technologically advanced vision correction surgeries coupled with high spending on advanced vision correction surgeries for aesthetic reasons account for the high growth of this region. According to the lead analyst of the study, “the demand for personalized LASIK surgery is directly influenced by rising spending on vision correction surgeries for aesthetic reasons. Individuals are increasingly opting for vision correction surgeries in place of spectacles and contact lenses for appearance and convenience. Individuals who undergo LASIK surgery do not need to use glasses or contact lens for vision correction until second surgery is required. The rising incidence of myopia and astigmatism provides significant growth opportunities for market players to offer corrective treatments. Along with this, the growing pool of presbyopia patients is stoking demand for vision correction surgeries thus propelling this market. Furthermore, increasing risk of infection due to continual use of contact lens, rising prevalence of ocular diseases, and emergence of newer ophthalmic technologies are likely to act in favor of the personalized LASIK surgery market in the years ahead. On the other hand, rise in number of cases of failure of surgery and post-surgery complications are providing headwinds to this market. High cost of advanced ophthalmology equipment along with high consultation and surgery charges makes LASIK surgery affordable by a limited number of individuals. This is slowing the growth of this market.